Craig Wencl, our Knight of the Month, comes from our neighboring KC Council in Blooming Prairie. 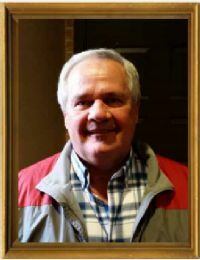 Craig has been involved in numerous KC activities in his home Council such as, pancake breakfasts, spaghetti suppers, Lenten fish fries, and has assisted our Council for a number of years, serving as altar server for our annual Memorial Mass. He was recruited into the Knights by his father, Dennis. Craig’s grandfather, Ludwig Wencl, was a long-time member of our Owatonna Council 945 until his passing a few years ago. Craig grew up in Blooming Prairie, along with a brother and sister. After high school Craig began working with Cedar Valley Services in Owatonna and currently has a job with Kwik Trip stores. Craig enjoys working at and attending many church and KC activities as well spending time with family. He is a also a fan of hockey and the Minnesota Wild. We thank Craig for all the time and effort he contributes to the Knights of Columbus and we congratulate him on being honored as our Knight of the Month. Our Knight of the Month is Kory Klecker. He became a Brother Knight in February 2003 and, not surprisingly, was sponsored by his father, LaVerne Klecker. 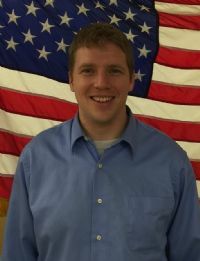 Kory grew up in Owatonna and following high school graduation he attended South Central Technical College to study Machine Tool Technology and Business Administration. He started his work career with Dagry Tooling where he was the Manufacturing Manager. He later made the move to join a new start-up company in Owatonna called Sputtering Components as one of their first employees. After 12 years with the company, Kory is currently the Director of Manufacturing. Kory and his wife Sara are members of Sacred Heart Parish. They have two young boys, Parker and Max, who you may have seen helping us with our KC Bell Ringing the last few years. In his free time, Kory enjoys watching his boys’ sporting events, as well as hunting, fishing, camping, and most any outdoor activity. In addition to his volunteer time at KC events, Kory also is involved with Ducks Unlimited and Minnesota Pheasants Association. We thank Kory for his many years of service and support to our Council and look forward to adding a third generation of Klecker family to the Knights down the road. This month we honor Fr. James Starasinich, new pastor at St. Joseph Church as Knight of the Month. Fr. Jim grew up in Joliet, Illinois, along with four brothers and one sister. After high school, Fr. Jim attended a local junior college for a year and then decided to join the Air Force. 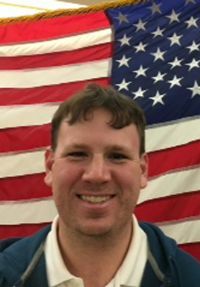 He spent four years in the Air Force, including his basic training in Texas and then stints in Wyoming, Arizona, and finally active duty overseas in Sicily, Italy. After leaving the service in 1985, Fr. Jim enrolled in the Seminary in New Jersey where he completed one year of studies. Still not sure that the priesthood was his calling, Fr. Jim then transferred to the College of St. Francis back in Illinois, where he completed his BA Degree in History, as well as obtaining his teaching certificate for grades 6 thru 12. Fr. Jim then reentered the seminary at a different seminary in New Jersey. It was during this time that he also joined the Knights of Columbus. Fr. Jim completed his training and was ordained in 1999, as both a Diocesan and Missionary priest. 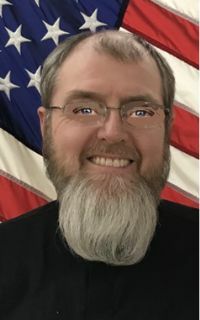 He initially served in three parishes in New Jersey before spending two years serving in the country of Estonia in eastern Europe and then placed as the Rector of a Seminary on the island of Guam for three years. Fr. Jim was eventually called back to the States and most recently served 12 years as pastor of Sacred Heart Church in Lyndhurst, New Jersey, before making the transfer to St. Joseph Parish here in Owatonna this past summer. In his spare time Fr. Jim enjoys fishing, bicycling, and watching sports, including his hometown Chicago Bears. He also continues to explore history and has been enjoying the discovery of the local history of his new home here in Minnesota. We are very blessed and honored to have Fr. James Starasinich as our pastor here at St. Joseph and as our Chaplain for our KC Council 945 and we congratulate him as our Knight of the Month for January. This month we honor long-time member Knight Paul Trautman as our Knight of the Month. Paul joined our Council in November 1991 at the urging of his neighbor, Tom Klecker, and soon became a Third Degree member. Paul grew up in Lake Benton, Minnesota near the South Dakota border. Following graduation from high school, Paul attended South Dakota State University in Brookings, South Dakota, where he earned a degree in Agribusiness. It was also where he met his future wife Mary. After college, Paul spent 42 years working with farmers in sales management in the ag business. He officially retired in 2014 but still does some consulting work for his previous employer. Paul and Mary moved to Owatonna in 1977 and are members of St. Joseph’s parish. They raised three children, Jennifer, Christopher, and Daniel who all live in and around the Twin Cities, along with their five grandchildren. Paul says he enjoys playing golf, hunting, and fishing, in addition to spending time with his grandchildren. He also considers himself an accomplished gardener. Paul has been involved in a number of Council activities, including Smokin’ in Steele, Tootsie Roll Drive, and Bell Ringing. He has been a participant in the annual KC fishing trip for many years and has helped coordinate the KC golf outing the past 2 years. We thank Paul for his many years of service to our KC Council and congratulate him on being named as our Knight of the Month. Our Knight of the Month Patrick Baldwin grew up in Olympia, Washington where he was a member of St. Michael's Parish and attended St. Michael's School. After graduating from high school he attended Washington State University, where he earned a degree in Hospitality Business Management. Patrick always enjoyed spending summers visiting relatives in Wisconsin and in 2000 he decided to relocate to the Madison, Wisconsin area to start a tour business. A few years later Pat met his wife Shari and they started their family in Wauwatosa, Wisconsin, where their two children, Jackson and Amelia, attended Wauwatosa Catholic School. Patrick has been involved in many entrepreneurial ventures over the years in the insurance and travel fields and currently work as a Field Claims Representative with the Cincinnati Insurance Companies. Since moving to Owatonna in late 2016, the Baldwin family have become members of St Joseph’s Parish in Owatonna and Jack and Amelia attend St. Mary's School. Patrick enjoys walking the family dog, Marley, going to sporting events, trying new foods and craft beers, traveling, history, and going on family vacations. One fun fact about Patrick is that he wrote the "Daddy Workout" book through Amazon publishing back in 2010. Patrick has been involved in a number of Council activities and says he enjoys being a Knight and is proud to be part of such great organization that represents his values and puts his faith in action. Congratulations Patrick on being our August Knight of the Month. This month we honor a long time member of our council, John Kniefel, as our Knight of the Month. John joined the Knights back in 1983 and was recruited by Joe Breckner. He eventually moved through the officer chairs and served as Grand Knight of the Council in 1986. Recently John has been helping with our KC bell ringing, Tootsie Roll drive, Smokin’ in Steele, as well as co-chairing our KC Family Golf Outing in September. John grew up and went to high School in Medford, Minnesota. 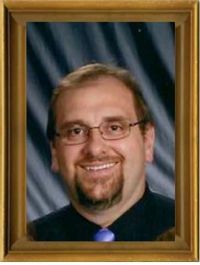 After high school he attended Winona State University where he studied Industrial Technology and received his teaching degree. 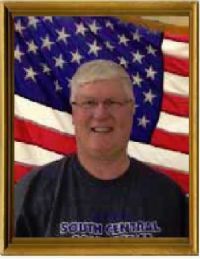 John taught HS Industrial Arts in Kenyon, Minnesota for five years where he also coached basketball. He then moved into the manufacturing field and took a job with Wenger Corporation in the new product development for 12 years. John then transferred over to work at Cybex for five years as Manufacturing Manager, and later returned to Wengers in the same position where he has been for the past 19 years. John has also served as a volunteer on the St. Mary School Board and the Sacred Heart Parish Council. He and his wife Pat raised two daughters, Melanie and Molly, who both live in the Twin Cities area. John enjoys golf, woodworking, and spending time with his three grandchildren. We thank John for his many years of service and support to our Council and congratulate him on being our very worthy Past Grand Knight and Knight of the Month. Our Knight of the Month is Fr. Stephen O. Abaukaka. He is a priest of the Catholic Diocese of Lokoja, Nigeria. He was born into the Catholic family of the late Pa Anthony Abaukaka and the late Mrs Veronica Abaukaka, June 7th, 1967. He is the fourth of six children; two of his older siblings had died and now has three siblings with many nieces and nephews, all back in Nigeria. After the completion of his secondary education he proceeded to St Thomas Aquinas Seminary, Makurdi, Benue State, where he completed a diploma program in Philosophy, and subsequently completed his Theological Studies with Bachelor of Theology at Ss Peter & Paul Major Seminary, Ibadan Oyo State, Nigeria, in affiliation with the Pontifical Urban University, Rome. He was ordained a Catholic priest May 3rd 1997 by late Bishop Joseph Sunday Ajomo. 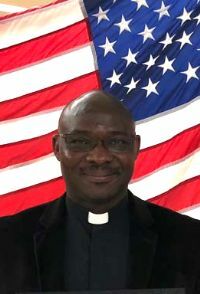 After his priestly ordination he served in many capacities in home diocese of Lokoja, Nigeria, until January 2011, when he came over to the United States of America. He enrolled for Graduate program in Pastoral Studies at the Catholic Theological Union, Chicago, IL, January 2011 and graduated with Master’s Degree in 2013. He subsequently worked with the Archdiocese of Santa Fe, NM, as a hospital chaplain. He entered into CPE program at the Genesis Health System, Davenport, IA, from August 2015 to August 2016. From September 2016 to October 2017 he worked at the Mayo Clinic, Rochester, MN, as Catholic Priest/Staff Chaplain. 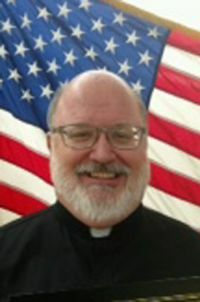 Thereafter, he has been with Diocese of Winona-Rochester since January 2018 as Parochial Vicar to St Joseph Parish, Owatonna. Congratulations to Fr. Stephen Abaukaka on being our May Knight of the Month. This month we honor Nate Skala as our Knight of the Month. Nate became interested in joining the Knights while playing with fellow Knights on a KC sponsored volleyball team and with some additional encouragement from master recruiter LaVerne Klecker, he joined the Council in 2012. Nate grew up in Owatonna and after graduation from OHS, Nate continued his education at Winona State University, where he also continued his football career. Nate received his BS Degree in Criminal Justice and began his professional career with Federated Insurance in the Twin Cities. 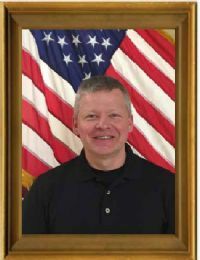 Three years later he moved back to Owatonna and just completed his 10th year with Federated, in his current role as a Special Investigator. Nate and his wife Diane are members of St. Joseph Church. They are busy parents with 4 1/2 year old twin son and daughter and the most recent addition of a 9 month old son. Nate is a big sports enthusiast and also works as a football coach for Owatonna High School. Nate has been involved in several KC activities over the years such as the Tootsie Roll Drive, Bell Ringing, and Smokin’ in Steele. He loves the volunteer opportunity that the Knights provide to give back to the community as well as the family involvement that is encouraged. We thank Nate for his time and support of our Council and again congratulate him as our nominee for Knight of the Month. Our newest Knight of the Month nominee is Dan Glaser. Dan joined our Council in November 2016 at the urging of master recruiter LaVerne Klecker. Dan grew up in Barron, Wisconsin in the NW part of the state. 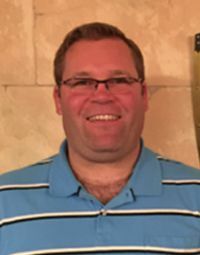 Following his high school graduation, Dan continued his education and received an Associate Degree from the Technical College in Eau Claire, Wisconsin, in Hotel and Restaurant Management. Dan later moved to Colorado Springs, Colorado, where he worked in Convention Services for the Broadmore Hotel. In 1988, Dan moved back to the Midwest to Rochester, Minnesota, when his spouse at the time took a job at the Mayo Clinic. Dan worked several years for a major contractor for IBM until 1995 when he joined Arnolds Supply Company, where he currently serves as V.P. of Operations. After becoming single again, Dan met Katie, the daughter of Brother Knight Gene Simon, which led to his relocation to Owatonna in 2015 and their marriage in 2016. In addition to wife Katie, Dan’s family also includes grown children daughter Courtney and son Ryan. Dan and Katie are big fans of Minnesota Wild hockey and the rock group Hairball. As a transplant from Wisconsin, Dan is also a big fan of a certain Green and Gold football team in Green Bay. Dan has also coached JV baseball for a number of years at Rochester JM High School and has now started working with the Owatonna Aces. In his short time as a Brother Knight with us, Dan has become an active member, volunteering for many of our fundraising events and joining the K of C Chorus. Dan says he enjoys working all the various KC events and meeting other members of the Council and the community. 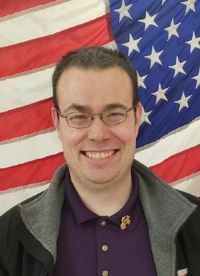 We are very happy that Dan has brought his time and talents here to Minnesota and Council 945 and we again congratulate him as our Knight of the Month for March. We are pleased to announce that Paul Jardine is our Knight of the Month for February. Paul joined our Council in 2015 and was sponsored by his father Lee Jardine, who is currently serving as an Officer for the Council. Paul was born in Hartland, Michigan, following five sisters and then his older brother Robert into the Jardine family. The family moved a few times before relocating to Owatonna in 2007. After graduating high school in 2015, Paul attended college for several semesters but realized he hadn’t really decided on a career direction. So he is currently working full-time at Bosch Corporation as he continues to explore his options for the future. One thing Paul is currently working on outside of work is learning to become fluent in Japanese. With his father Lee having spent time in Japan while working in the auto industry years ago and his brother Robert spending a year studying abroad in Japan, Paul became very interested in the people and culture of Japan. He visited his brother in Japan in January and now he’s working to learn the language, with maybe another extended visit in the future. Like his father, Paul has become an active member of our Council and he says he particularly enjoys working the pancake breakfasts and meeting the customers. We are very blessed to have a fine young Knight like Paul and a second generation of the Jardine family actively engaged in our Council and we congratulate him on being our latest Knight of the Month recipient. This month our honored Knight is Ryan Heydon. Ryan joined our KC Council in August 2016 and was sponsored by Brother Knight Lynn Becker. Ryan was born and raised in Owatonna. After graduating from Owatonna High School, Ryan enrolled in Riverland Community College where he received an Associate Degree in Music. Ryan’s interest in music continues as he has become an active member of our KC Chorus and also sings as a church cantor at his parish of St. Josephs. Another significant area of interest for Ryan is aviation. Ryan’s uncle was a pilot who got Ryan interested in flying at an early age. Ryan is currently a student pilot working on achieving his pilot’s license. 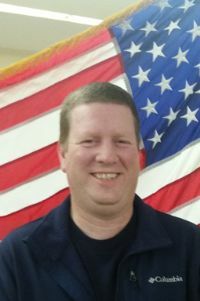 He has also been active with the local Civil Air Patrol, 1 of 24 squadrons in Minnesota, for the past five years. Ryan currently serves as a Squadron Commander. 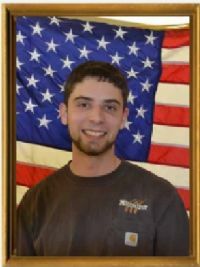 Ryan also works full-time as a press break operator with Northern Tool and Equipment in Faribault, Minnesota. In addition to becoming an active member of our Council, Ryan has spent 13 years working along with Dan Bauer and serving as a Youth Mentor with the Catholic Youth of Owatonna. Ryan said he enjoys the camaraderie, friendship, and support he has received from his fellow Knights during his time with the our Council. We certainly appreciate Ryan’s supportive work within our community, our parish, and our Council and we are very pleased to salute him as our Knight of the Month for January. Our Knight of the Month is Troy Skalicky. Troy joined the Knights in November 2013 and was sponsored by his father, Jim Skalicky. He did admit that master recruiter LaVerne Klecker worked hard to encourage him as well. Troy was born and raised in Owatonna along with his two brothers, Kevin and Brent. 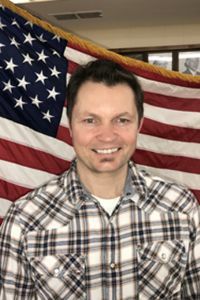 He attended St. Mary’s School and then following high school graduation, he enrolled in the former University of Minnesota – Waseca campus, where he earned an Associate’s Degree in Agriculture. Troy joined his father in running the family farm and also took employment with Wengers Corporation in Owatonna. This year will be Troy’s 25th year at Wengers, in which he works as a CNC Programmer. Troy and his wife Anne are members of St. Joseph Parish and they have two daughters, Katie who is currently attending college at North Dakota State University and Nicole who is a sophomore at Owatonna High School. With what spare time he has, Troy enjoys spending it with family and going up North during summer vacation trips. This past summer Troy helped with our grandstand beer sales at the Steele County Free Fair and then the Skalicky family again helped with our Salvation Army Bell Ringing Day. Troy continues to be impressed with all the charitable works that our Council does and how much is given back to the community. We thank Troy and his family for all they have contributed to our success and we again congratulate him as our Knight of the Month. Our Knight of the Month for November is Richard Gerdts. Rich said that LaVerne Klecker had been insisting he join the KC’s ever since he got married back in 1988. Rich decided to just focus on one new relationship at that time but he eventually found his way to our Council in 2015 and was sponsored by Eric Tucker. Rich grew up in Owatonna and after graduating from high school, he worked with his father’s crop farming operation and also rented a farm next door. 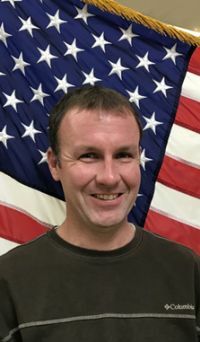 Rich also worked on dairy farm operations, but in 2000, Rich decided to move from farm tractors to tractor trailers and began a career as a truck driver. 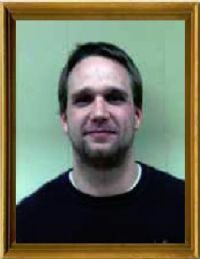 He drove for Keck Enterprises, Sampson Dairy, and Foam Craft where he currently works. He and his wife Sue are members of Sacred Heart Parish. They have four children ranging in age from 13 to 23. Their oldest son Josh is in the US Marine Corp currently stationed in Okinawa, Japan. Daughter Joan works for Jostens here in town, Holly is a 10th grader, and youngest son Jason is an 8th grader. Rich has enjoyed getting involved in our KC breakfasts and doing bell ringing for the Salvation Army. He believes the special thing about the Knights of Columbus is the camaraderie of the membership. We thank Rich for being a part of this great Council of Catholic men and we congratulate him on being our Knight of the Month. Our Knight of the Month is Jeff Vortherms. Jeff joined our Council in November 2015. Jeff said he met a number of now Brother Knights who caused him to consider joining but in the end it was the persistent voice of LaVerne Klecker that kept in touch with Jeff and sealed the deal. Jeff grew up in the town of Fulda, Minnesota, in the southwest part of the state. After graduating high school, Jeff attended the community college in Worthington, Minnesota, and then went on to Southwest Minnesota State University. His first job out of school was in medical supply sales. His interest in sales eventually brought him to his current career with Schwans Home Services where he has been employed for the past 14 ½ years. Jeff and his family moved to Owatonna in 2009 when he took over as the Area Manager for Schwans, covering the area between Northfield, Mankato, Rochester, and down to the Iowa border. Jeff and his wife Stacy have two boys and two girls ranging from 1st grader Evan, 4th grader Ellie, 6th grader Ethan, and 9th grader Erika. When not working, Jeff enjoys playing golf but most of his spare time is devoted to attending all the multiple activities of his four active children. Jeff has been involved in a number of KC activities and says that it is a great group of people in the Council to be around and has really enjoyed the experience so far. We look forward to Jeff’s continued involvement within our Council and congratulate him on being selected as our Knight of the Month. Our Knight of the Month is Fr. Kevin Connolly. Fr. Kevin joined the Knights in 1978 and currently serves as Chaplin for our Council. Fr. Kevin was born and raised in Montana until the age of 11 when his family moved to Winona, Minnesota. Following his high school graduation, Fr. Kevin attended St. Mary’s University of Minnesota where he majored in History and later attended St. Paul Seminary. He was ordained into the priesthood in 1985. His first assignment was at the Cathedral of Sacred Heart in Winona, where he also served as a half time teacher at Cotter High School. After a number of parish assignments, we were fortunate to have Fr. Kevin take over as pastor of St. Joseph Parish in July 2016. Fr. Kevin’s family includes four sisters and one brother, as well as his 92-year-old mother who lives in St. Paul. Fr. Kevin enjoys following our Minesota sports teams the Twins, Wolves, and Vikings, as well as music, reading, and studying history. We are very pleased to have Fr. Kevin here in Owatonna leading our St. Joseph Parish community and being an active member of our Knights of Columbus Council. Congratulations on being our Knight of the Month for September. Our Knight of the month for August is Vince Guiggisberg. Vince joined our Council in May 2016 and was sponsored by Tom Jirele. He credits Brian Carlson who worked with Vince when he was in Boy Scouts for his initial interest in joining the KCs. Vince grew up on a farm between Owatonna and Ellendale and went to school in New Richland- Hartland-Ellendale-Geneva, graduating in 2011. He has been doing farm work for the past seven years. He enjoys being able to work outdoors and likes the idea of raising his own beef and knowing how they have been cared for. Vince was just married on August 12th to his new bride Tara. They make their home in Owatonna and are members of Sacred Heart Parish. Vince enjoys playing a variety of sports, also camping and hunting, basically anything involving the outdoors. Vince has spent many hours helping with a variety of KC functions, such as Smokin’ in Steele, pancake breakfasts, fair booth, and Tootsie Roll Drive. He likes the fellowship and the ability to help others in the community that comes from being a member of the Knights of Columbus. Thank you Vince for your active participation as a new, young member of our KC Council and congratulations for being named our Knight of the Month. Our Knight of the Month, Greg Robillard, joined our Council in 2015. He was born and raised in Minneapolis, Minnesota and after high school he joined the US Marine Corp for a four year stint. Following his military duty, Greg enrolled in Colorado Technical University where he studied Business Management and Computer Science. Following graduation he worked as a college professor for ten years. 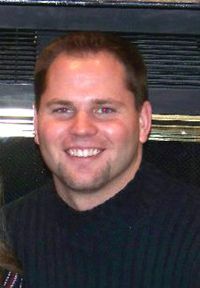 In 2004, Greg relocated to Owatonna to be closer to his immediate family. Greg currently works managing a team of software engineers for a company that supplies the majority of air traffic control systems internationally. He works primarily from his home office staying in virtual contact with his team across the country. Greg and his wife Kristi have two sons Thomas and Lucas, ages 17 and 15. They are members of St. Joseph Parish. When asked about hobbies outside of work, Greg mentioned the Missouri 340 (Mile) Canoe Race that he and a friend are going to compete in later this year. You may have seen Greg helping man the griddles for our KC breakfasts or at Smokin’ in Steele and he looks forward to becoming more involved with the Council as his busy schedule allows. Greg has two brothers who are Knights in different Councils and they are amazed, as Greg is, at the level of support and activity that our Owatonna Council generates. We wish Greg the best of luck in his upcoming big river paddling adventure and congratulate him on being our Knight of the Month for June. Our Knight of the Month, Tony David, joined our Council in June 2015, following in the footsteps of his father, Wally who is a First Degree Knight with the Faribault, Minnesota Council #889. Tony joined the KC’s at the urging of LaVerne Klecker after Tony had volunteered to direct the Smokin’ in Steele 5k Run/Walk in 2015. Tony became a Third Degree Knight in November 2015 and became Sir Knight Tony of the Fourth Degree in April 2016. 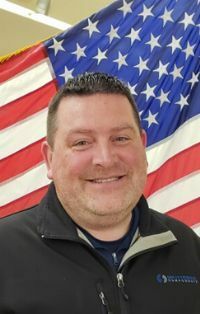 Tony was born and raised in Owatonna and after high school graduation he attended Alexandria Technical College where he earned an Associate Degree in Law Enforcement in 1989. Tony began his career as a police officer with the St. Cloud Police Department. He later worked for the Police Departments in Waseca, Morristown, and Waterville. 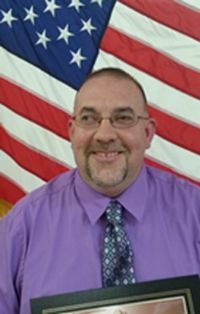 In 1998, Tony joined the Steele County Sheriff’s Office as a deputy sheriff, where he is currently assigned to the civil process division. Tony has also taught the Drug Abuse Resistance Education (D.A.R.E.) Program to elementary students in the NRHEG and Medford school districts for ten years. Tony has been married to his wife Sonya for seven years and has two adult daughters, Miranda who lives in Mankato and Danielle, who is a student at the SC Technical College in North Mankato. Tony also has two stepchildren, Jordan and Tyler, along with three grandchildren Cooper, Ryder, and Charlotte and another due in June. Tony enjoys turkey and deer hunting, fishing, and volunteer instructing youth firearms safety with the Minnesota DNR. 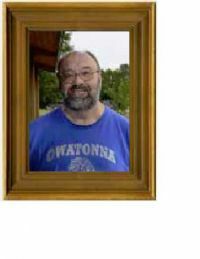 For the past eight years Tony has been a volunteer coach with the Owatonna Special Olympics. 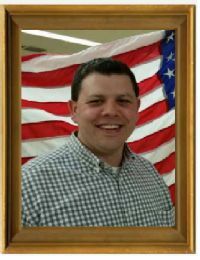 He also serves on the Owatonna Special Olympics Area Management team and the MN Special Olympics Polar Plunge Committee. Tony has been a very active member in our Council, helping with just about every Council event and activity during the year and was the Chairperson for the most recent Tootsie Roll Drive. He also serves as the Council Recorder and the Fourth Degree Assembly Scribe. Tony is a true example of service and support to our Council and our community. We are very blessed to have Tony as an active member helping our Council touch the lives of others and we congratulate him as our April Knight of the Month. Our Knight of the Month, Matt Thurnau, joined our Council in May 2012 along with his father, Ken Thurnau. Next door neighbor John Ahlberg was the one who convinced him to join and he is very glad he did finally say yes. Matt was born and raised in Owatonna and went to St. Mary’s School through 8th grade. After high school graduation, Matt enrolled at St. John’s University and graduated with an English degree. He then joined Federated Insurance and has been there for 28 years. Matt also worked paid on call with the Owatonna Fire Dept. for 13 years and just retired from that position in March of this year. In 2016, Matt was honored as Firefighter of the Year. Matt has been married to Karen, his high school sweetheart, for 26 years. They have three girls, Grace, a freshman at Viturbo College, Sophie, a sophomore at Owatonna High School, and Annie, a 7th grader. Matt and his family enjoy biking, gardening, and trips up North. 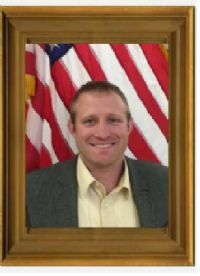 He has also served on the Planning Commission for the City of Owatonna. Matt has been involved in a number of KC activities over the years but particularly enjoys working as the “young kid” on the Saturday breakfast prep. Matt said that he realizes now as an active member just how many people and causes that the KC’s touch in its mission of service to the community and to the Church. We are very glad that Matt has been one of those active members who helps our Council touch the lives of others and we congratulate him as our Knight of the Month for March. Our Knight of the Month, Mike Jensen, has been a member of our Council since March 1996. Mike joined not long after he and his family moved to Owatonna, following in the footsteps of his grandfather who was a Fourth Degree Knight. Mike grew up in Worthington, Minnesota, in the southwest part of Minnesota. After graduation from high school, he went on to pursue a degree in Business Administration at St. John’s University in Minnesota. Right after graduation he started working for 3M Company and spent the next 15 years living in the Twin Cities. Mike later changed jobs to work at E.F. Johnson in Waseca and Mike and his family moved to Owatonna. Mike and his wife Kathleen raised a set of twins. Their son now lives in St. Paul working as a science teacher at Hill Murray High School and their daughter studied at Columbia University and now lives and works in New York City. Mike and Kathleen have been active in St. Mary’s School, where Kathleen has worked for a number of years as a Teacher’s Aide and Mike on the school board. Mike retired in 2011 and spends his new found free time playing golf, reading, occasional fishing, hunting trips, and working KC events. Mike has been a fixture on the Saturday morning breakfast set up crew and has also helped with the annual Tootsie Roll Drive, Salvation Army Red Kettle Bell Ringing, and benefit suppers. Mike says it is great to see that the Knights of Columbus have so many people who give so much of their time and effort for charity and service to others. We thank Mike for his many years of service and support to our Council and congratulate him on being our Knight of the Month for February. Our Knight of the Month for January is John Nelson. John joined our Council in November 2009. He was sponsored by his father, Brother Knight Stephen Nelson, and acknowledged he was also encouraged to join by LaVerne Klecker and Dave Lax from the KC Chorus. John, along with his six siblings, attended St. Mary’s School and Owatonna High School. After graduation, he attended the University of St. Thomas where he studied Math and Spanish. 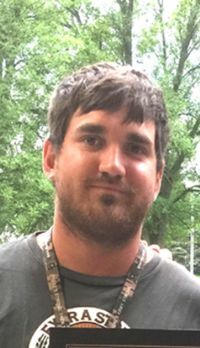 He later received his Master’s Degree in Education from Notre Dame University, which helped place John in his first teaching job in a small river town in Louisiana. John said it was as much of a learning experience for him as it was for his students. John eventually moved back to Minnesota, and in 2013, married his wife Annie at the Cathedral in St. Paul. They have two young daughters Betsy and Violet. John and his family have recently moved back to Owatonna from St. Paul and he is currently a math teacher at Lourdes High School in Rochester, where he also coaches the Jr. High football team. Among his other interests, John enjoys the outdoors, canoeing, and time in the Boundary Waters Canoe Area. John also enjoys music, which led him to joining his father as an active member of the KC Chorus. He has also been involved in other KC events such as the Tootsie Roll Drive and Smokin’ In Steele. John said he appreciates the strong role that the Knights play in support of the church and its impact in the community, along with the brotherhood, and support it provides to member Knights and their families. Thank you, John, for lending your voice and talents to our Council and congratulations on being our Knight of the Month. 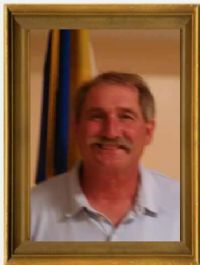 Our Knight of the Month Mike Meger joined Council 945 in June 2006. If the Meger name is familiar, it's not surprising since Mike is one of four Meger men who are Brother Knights in our Council, including brothers Brett and Alex and his father Past Grand Knight and Past Faithful Navigator Glen Meger. Mike graduated from Owatonna HS in 2003 and went on to college at North Dakota State University, where he received a wrestling scholarship. After earning his bachelors degree at NDSU, Mike moved to Chicago to enroll in Worsham College of Mortuary Science. 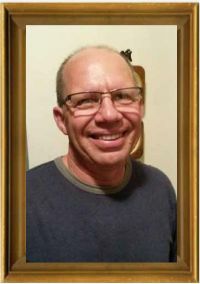 Mike did his internship in the Chicago suburb of Skokie, Illinois, and then worked a couple of years for a funeral home in North Dakota, before returning to Owatonna to join his father at the Brick-Meger Funeral Home. Two months ago, Mike married a young lady named Destinee from Eyota, Minnesota, who he met while at school at NDSU. They are members of Sacred Heart Church and are proud parents of Harvey the dog. When not working in the family business, Mike is an active supporter of the Owatonna Wrestling program. He has been a coach at the varsity level and this year he will also be working with the youth wrestling program. Mike obtained his K of C 2nd and 3rd degrees in 2013 and has helped with a number of Council activities over the years. In particular he has enjoyed working events such as Smokin’ in Steele and the SCFF food stand. Mike mentions the volunteerism and the camaraderie as the most positive aspects of his membership in the Knights of Columbus. Everyone gets along and are all great to work with. He looks forward to getting more involved in the faith and fellowship activities of the Council and perhaps in the future leading his generation of young Knights into the next generation of Council leadership. We certainly encourage Mike to follow in the family tradition of another PGK from the Meger family. Congratulations to Mike Meger, our September Knight of the Month. Our Knight of the Month, Pat McGrath was like many Brother Knights before him. He heard the KC speeches at church encouraging him and others to join and he had thought about it a number of times but in his words just never pulled the trigger on it. He credits his co-worker and Brother Knight Mark Kearin for getting Pat to finally make the commitment and he hasn’t looked back since. Pat grew up in Fairmont, Minnesota in the SW part of the state. After high school he enrolled in Mankato State University where he graduated in 1999. 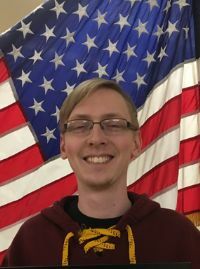 Soon after graduation he started his work career at Federated Insurance in Owatonna, where is still employed today working in the Information Services Department. Along the way he got married to his wife Kristi and started a family, which includes daughter Paige, who is a 1st grader at St. Mary’s School and son Mason, who will be starting kindergarten next year. Pat and Kristi could be considered a blended family, with Pat raised in Minnesota as a Viking fan and Kristi, who grew up in Sturgeon Bay, Wisconsin, still having loyalty to a certain rival team across the border. In addition to spirited football Sundays in the McGrath household, Pat enjoys activities with his children, a lot of which includes shuttling to and from swimming or tennis sessions. Pat says he enjoys fishing but doesn’t get out much these days and in winter you may find him on the ice at the Owatonna Curling club. Pat has been involved in KC events such as Smokin’ in Steele and the Steele County Fair, but says he most enjoys working the pancake breakfasts. He likes working with the rest of the breakfast crew, interacting with the customers, the time goes by quickly and it’s just fun. Instead of feeling like work, if just feels good to be helping others. We thank Pat for becoming an active new member in our Council and we are very glad he finally took that leap to join. We are sure he will help others down the road to do the same. Our Knight of the Month, Keith Martin, joined our Council in March 2011. He follows in the footsteps of his father Allen Martin who has been a member since 1973. Keith also gives credit to our now retired KC insurance agent Kevin Gallagher for encouraging him to become an active member. Keith is a lifelong resident of Owatonna and is the owner of Block Plumbing and Heating. The Martin family includes wife Wendy, sons Brody and Kollin and daughter Lilian. Keith is a big hockey fan with both himself and his children all present or former players and of course he is a big supporter of the Minnesota Wild. 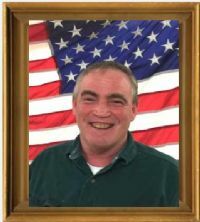 Outside of work, Keith enjoys coaching his youngest son in youth football along with outdoor activities such as hunting, fishing, and riding his motorcycle. Over the years Keith has been involved in a number of KC activities such as KC breakfasts, Steele County Free Fair, Smokin’ in Steele, and working the Tootsie Roll Drive along with his children. Keith said the positive experience of being a member of the Knights of Columbus is that it has been a great way to get out and meet new people and has given him the opportunity to help the community. We thank Keith for his service to our Council and congratulate him as our latest Knight of the Month recipient. Our Knight of the month, John Green, joined our Council in 2002, and not surprisingly was sponsored by master recruiter LaVerne Klecker. However, what was unique is that John made it a family affair by joining at the same time with his father, Roger Green. John was born in Luverne, Minnesota and moved to Owatonna in 1982. After high school, John attended RCTC to study the construction trades, and he has been in the carpentry/construction business for the past 20 years. In 2005, John started his own contracting construction business doing both residential and commercial building. John is married to wife Amy, and they have three daughters ranging in age from 14, 10, and 6 years old. John is no stranger to being the only man in the house as he grew up in a household with four siblings, all sisters. John is currently a 3rd degree Knight and has been involved in a number of KC activities over the years. When asked to choose his favorite, it would be working the Steele County Fair Grandstand as that has the most people interaction. When he gets a break in his busy schedule, John enjoys the opportunity to hunt and camp and hopping on his motorcycle. Being in sports for most of his life, John has enjoyed being part of a team and that is what he has enjoyed in being part of a great team with KC’s and the camaraderie with his fellow Knights. Over the years, he has become more aware of the positive impact that the Knights of Columbus has had on its members and the community. Thank you John for building a long partnership with our Council and we look forward to your continued support of our Council 945 team of Knights. Ron Starman was named the Knight of the Month at the recent regular Council 945 meeting. Ron said the announcement was a ‘nice surprise’ and doesn‘t feel that he really deserves it. Well, he does – and that’s why he was chosen. He has been a member of the Knights for over 30 years. During that time he has worked on many projects – Free Throw Contests, Breakfasts, the Tootsie Roll handout, and Smokin’ in Steele. His favorite projects are the last two since they “Raise funds for such a great cause” (Special Olympics). He has served on the Building Committee for around 20 years, assisting with the operation of the KC Hall. Many hours were spent doing annual cleanups, lawn and shrubbery care, and any all around ‘stuff’ that is needed to keep the place looking good. Ron is the Produce Manager at Cashwise where he has worked for many years. His free time is spent reading and watching various sporting events. Ron and his wife Erica belong to Sacred Heart parish and have helped out there as well. He is a Eucharistic Minister and has taught JH REP a number of years. He also is a member of a Bible Study group that he enjoys a great deal. They have three grown children: Tana, 25, a French teacher in Omaha who is moving to China for a two-year stint teaching English; Tess, 22, a recent graduate of Creighton who just started a job with Big Brothers Big Sisters in Nebraska assisting chapters with their work; and Timothy, 19, a sophomore at MSU-Mankato, majoring in French education. Ron said, “I really enjoy working with my Brother Knights as well as the social aspect of the group. Now that the kids have moved on, I hope to get a little more active with the Knights.” Now that’s the kind of excitement we like to see ! ! ! 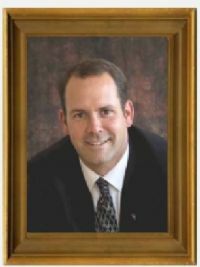 Our Knight of the Month Matt Durand joined our Council as a First Degree member in April 2012. Matt’s father was an active KC member and Matt recalls attending many KC events while growing up in Medford, Minnesota, and living not far from the KC Hall in town. Following high school, Matt attended college at Minnesota State-Mankato and graduated with a degree in Construction Management and just recently completed his Masters Degree. 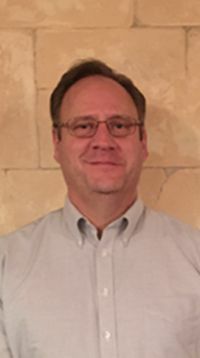 He initially spent five years in commercial construction with Kraus Construction and then went on to become the Storm Water Manager for the City of Owatonna, a position he held for six years. Currently, he works with Moes Homes doing residential construction. Along the way, he met his wife Jennifer from Owatonna and they have three children ages 14, 9, and 8. Matt has been involved in many Council activities and events and says he joined the KC’s because he wanted to stay involved in the community. In fact, volunteering in the community is one of Matt’s hobbies as he calls it. He served a number of years on the Cannon River Watershed Board and is also on the Steele Co. United Way Board. Matt says that the work our Council does in the community is phenomenal and he is glad to be a part of it. We are glad too Matt. Congratulations on being our Knight of the Month recipient. Gary Keller, our Knight of the Month, got started as a Knight with our Council back in July 1975 at the urging of his father-in-law Pete Schneider. Gary married Pete’s daughter Margaret, or Peggy as she is most known by, in 1974 shortly after he arrived in Owatonna from North Dakota. Gary was raised on a farm in North Dakota and went to school at Wahpeton State School of Science. 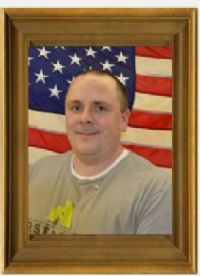 While he was there, he talked to a recruiter from Owatonna Tool Co. and upon graduation, he and two of his classmates ventured east to Minnesota and began their work careers at OTC. 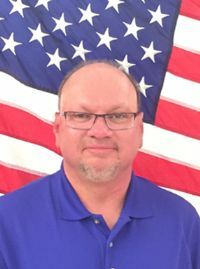 Over his first 27 years at OTC, Gary worked as a machinist, then moved to Engineering, Quality Assurance, and finally spent a number of years in Purchasing. After leaving OTC for 12 years of work with Foldcraft, Gary eventually returned to his old employer, which is now Bosch, and just retired in 2015. Over that time Gary and Peggy raised three daughters, Gwen, Carla, and Mary, who in turn have provided 7 grandchildren for Gary and Peggy to enjoy spending time with. Since his retirement Gary stays busy with his hobby farm, gardening, and tending to his horses. He has started to do more traveling, which included a recent train trip to North Dakota and California and more is in the planning stages now that every day is Saturday in his retirement world. Gary recalls fond memories of his many years working with the Bingo Crew and also activities such as the fair food stand and pancake breakfasts. Now that he has more time on his hands he hopes to again get more active in Council activities going forward. While talking about his time with the KC’s Gary said he has particularly enjoyed the camaraderie and working with all his fellow Knights doing good work in the community and for the Church. Gary is a Fourth Degree member and belongs to the Msgr. Henry Speck Assembly. He joined the Fourth Degree in October 2010. Congratulation Gary on being our Knight of the Month and thank you for your many years of service with our Council. Our Knight of the Month for March is Frank Evans. 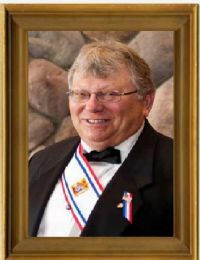 Frank became a first degree member of the Knights on January 10, 1996, and was sponsored by Brother Knight Mark Nelson. His brother, Greg Evans, is also a member of our Council. Frank and his wife LaRae are originally from a small town in North Dakota near the Canadian border. Last year, they celebrated their 40th wedding anniversary. 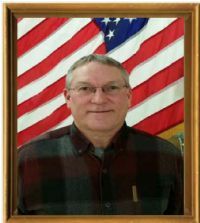 Frank served in the Army from 1970-72 and lived in Fargo, ND, for a few years before he and LaRae moved to Owatonna in 1978. 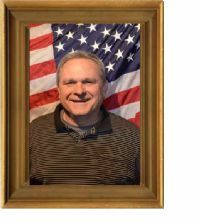 It was then that Frank began working at Olympic Fire Protection where he is still employed and currently serves as Vice President of Operations. Frank and LaRae have three grown daughters: Amanda and her husband Matt who have three boys; Catie and her husband Jeff and their two boys; and daughter Jackie who lives in Duluth, Minnesota. Over the years, Frank has been involved in a number of Council activities such as the I-35 clean-up, bingo nights, pancake breakfasts, fair food stand, and Smokin’ in Steele. In addition to spending time with his grandchildren, Frank also enjoys the art of home brewing. Congratulations Frank on being our Knight of the Month and thank you for your 20 years of membership with Council #945. Our Knight of the Month for January, Tom Standke, has been a member of our Council since 1991. Tom is an Owatonna native and he and his wife Sandy are members of Sacred Heart Church where Tom coordinates the church ushers. They have two grown children Eric and Beth who both live in Owatonna, along with their four grandchildren, all boys. Tom has been employed with Harland’s Tire in downtown Owatonna for the past 35 years. Over the years, Tom has been involved in many Council activities such as bingo nights, pancake breakfasts, spaghetti suppers, I-35 clean up, and Smokin’ in Steele. 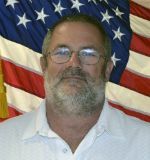 He has also served as Community Director for the Council. When it is time to relax, Tom enjoys golfing when he gets the chance but most of all he loves spending time with his four grandchildren. Tom says he enjoys his time with the Knights participating in our chartable activities and helping people and the friendly faces that greet him when down at the KC Hall. Thank you Tom for your years of fellowship with our Council and we look forward to welcoming those four grandsons as future Knights someday. Our December Knight of the Month can best be described as a man of extreme loyalty and dedication. A Brother Knight for the past 30 years, a husband of 36 years, and now an employee starting his 42nd year with the same company. I guess when you find something you like you stick with it and that surely appears to be the case for our honored Knight Adrian Seykora. Adrian grew up on a farm south of Owatonna near Litomysl. At age 15, he started working part-time for a local seed company helping with crop pollination. Someone later asked him if he would be interested in coming to work there full time and, 41 years later, Adrian is still working at what is now Syngenta in their research department. In 1979 Adrian married his wife, Philomena and they raised three children, Tiffany, Bradley, and Michelle. Brad is the owner/operator of the local Seykora Asphalt Company. Adrian joined our KC Council in 1985 and he and his young children at the time got involved in a number of family activities. Over the years, Adrian has assisted with benefit breakfasts, hall dinners, and a number of other activities. However, he is most noted for being in charge of the nativity scene in front of the Hall. Years ago Adrian was part of the group that purchased the statues and, for the first ten years, assembled and disassembled the scene each year, dragging the pieces to and from the hall attic area. Eventually, someone decided it would be easier to keep it together and it got stored at various locations, including Adrian’s home for the past 11 years. Adrian says he has greatly enjoyed meeting new people and working the various events during his time with the Knights. We congratulate Adrian for his many years of faithful service to his family, his job, and to our Knights of Columbus Council 945. Our latest Knight of the Month could be considered the apple that didn’t fall far from the tree. Alex Pieper joined the Knights in 2012, sponsored by his father Will Pieper, who is one of the more active volunteers in our Council. Alex has taken up the mantle of an active KC volunteer, serving many hours on events such as Smokin’ in Steele, Kids Q, Benefit Breakfasts, and Halloween Party just to name a few. Alex says he enjoys working the many youth events because at age 22 he still feels like a kid at heart. Alex and his family, which includes mother Stephanie, a brother and two sisters, are members of St. Joseph Church. Alex works full time at McClain’s in Northfield which keeps him busy along with his KC activities. Alex says he enjoys his experience with the Knights because of the friendships and the chance to help other people. We thank Alex for his enthusiasm and his service to our Council. He is well on his way to becoming another strong branch of the Pieper family tree in Council 945. Congratulations on being our November Knight of the Month. Our Knight of the Month for November, Greg Evans, started his journey with the KC’s back in January 1996 when he obtained his First Degree and then a few years later his Second and Third Degrees. 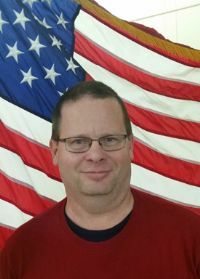 Over his close to 20 years of membership, Greg has been involved in many Council activities including the Fair Stand, Tootsie Roll Drive, I-35 Clean-Up, Red Kettle Bell Ringing, and Smokin’ in Steele to name a few. 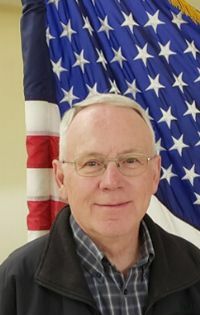 Greg grew up on a farm in North Dakota and moved to Owatonna in 1979 when he took a job with Olympic Fire Protection where he has worked for the past 36 years. He says he is planning to retire next year and will hopefully have more time to donate to KC events in the future. Greg and his wife Joann are members of St. Joseph’s Church. Their family includes three children, a son living in Hastings, a daughter in Owatonna, and a son who passed away. Greg is also proud of his three grandchildren. In his spare time, Greg enjoys gardening, sports, and of course spending time with his grandchildren. Greg says the best part of being a member of the Knights is enjoying the people he has met, the friendships he has made, and the good causes he has helped support. We wish Greg all the best in his upcoming retirement and look forward to his continued support of our Council in years to come. Congratulations again to Greg Evans our Knight of the Month. Fifty-seven years and counting. That is how long our Knight of the Month Bill Regan has been a member of the Knights of Columbus. Bill joined the Knights in 1958 at the parish in Adams, Minnesota. The pastor at the time was Fr. Leonard Clausen, who later became the pastor of Sacred Heart Parish in Owatonna. Bill recalls his early days in the KC’s when Fr. Clausen would join the other KC members for games of poker after the monthly KC meetings. Bill attended St. Thomas University and was in the ROTC Program, which lead to his joining the Air Force where he served as a pilot for four years. When Bill exited the service in 1954, he returned to his home in LeRoy, Minnesota, and bought three buses to start his first bus company. It was there that Bill met his wife Sally. Bill and his family moved to Owatonna in 1968 when he purchased the former Mason Bus Co. and established the Owatonna Bus Co. During their 59 years together, Bill and Sally have raised eight children, who have provided them with 20 grandchildren. All their children attended St. Mary’s School and Bill noted that his oldest daughter Ann was in the last graduating class at the Catholic high school in 1975. He recalls in his more active years with the Knights, working on the Lenten Fish Fries and the old KC Food Stand at the fair. Bill tries to stay active with the Fourth Degree these days and believes strongly in the great works of charity that the Knights perform and how they help solidify the Catholic faith in the process. We thank Bill for his many years of service and dedication to our Council and we are honored to have him as our Knight of the Month recipient. Our August Knight of the Month is Tom Kubista. Tom joined the KC’s back in 1987 and pancake breakfasts became one of the first activities that he and his family became in involved in since they lived right across the street from St. Mary’s school at the time, so they just had to cross the parking lot. Tom said they enjoyed getting involved in many family activities when he joined the Knights and the breakfasts were a good way to get to meet other members. Tom has been involved in a number of KC events during his membership and recalls working at the fair food stand for many years. Tom and his family are members of Sacred Heart Church. He and his wife Jane have two grown sons living in the Twin Cities; a daughter attending St. Mary’s University in Winona and their youngest son Mark who is a junior in high school. Tom has recently retired after a 30-year career working for Caterpillar Company. These days, he drives bus part-time and continues to be an active volunteer leader with the KC’s sponsored scout troop in Owatonna. Tom said being a member of the Knights of Columbus has helped him to live his faith through the charitable works he has been involved with through the Council and all the while having a lot of fun in the process. We thank Tom for his many years of service and support to our Council and community and congratulate him on being our Knight of the Month recipient. Kevin Herzog is no stranger to Council 945. He became a member of the Knights of Columbus on November 23, 2003. And, yes, he was sponsored by Brother Knight LaVerne Klecker. When asked why he joined, he said his Dad was an active member and he saw firsthand the enjoyment his father shared with him. 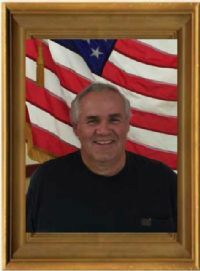 Kevin is employed by Gramse Plastering in Faribault, and has worked there for 31 years. His happy demeanor is because his wife Mary of 35 years, has been his life and inspiration. Kevin and Mary have three adult children, son Joe, whom he sponsored as a member, daughters Rachel and Elizabeth. He says his pride and joy are his three grandchildren, Ben, Grace, and Isla. Kevin has been involved with the I-35 clean-up project, Smokin’ in Steele, and is always willing to lend a helping hand around the club when asked. Kevin likes to golf, fish, and loves to water fowl hunt in North Dakota. Personal enjoyment for Kevin is gardening, and he loves to watch tomatoes grow. He also loves to play league volleyball, his team is sponsored by the Knights of Columbus. Family is top priority for Kevin, as his whole family, for the first time, in a long time spent an entire week up north near Alexandria vacationing and just having fun. He and his wife Mary are members of Sacred Heart Church where Mary is involved with many Ministries. Kevin has also shared that friends of his from other Councils in Minnesota who visit have told of how the Owatonna Council has so much to be excited about because Council 945 has great structure and support and help from its members. Congratulations Kevin Herzog, Council 945 July Knight of the Month! Steve Heimerman's musical talents are getting him noticed. While he's modest about his musical abilities, the time and talent he puts in to the KC Chorus have helped the choir be as good as it can be – and it's also earned him honors as Council 945's Knight of the Month. Steve has been a member of Medford's Council 4909 for about 20 years, but he joined the KC Chorus a couple of years ago after his brother, also a choir member, helped him join. Steve had been singing with the church choir for a number of years, so the transition to the KC Chorus seems a natural one. However, he hasn't limited his contributions to just the weekly rehearsals – he's also active in his own Council, having participated in the Tootsie Roll sales and the KC Lodge fundraiser when they held it years ago. “I enjoy helping,” Steve said. 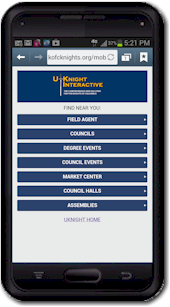 “All the different programs and goodwill that is done – there are just so many different ways the Knights help. I just like the opportunity to help a lot of other organizations and groups through the Knights.” Steve and his wife Laurie have been married 28 years. They have two adult children and one grandchild. They are members at Sacred Heart in Owatonna, where Steve also sings in the choir. Steve's new calling is at Owatonna's Bushel Boy, where he recently signed on as the Facilities Manager. Prior to that, he spent 28 years working for Malt o Meal in Northfield. Steve enjoys riding motorcycles and snowmobiles, and also enjoys working on an antique car that he owns – a 1929 Model A. Congratulations to Steve Heimerman, Council 945's June Knight of the Month! The May Knight of the Month hails from Medford. 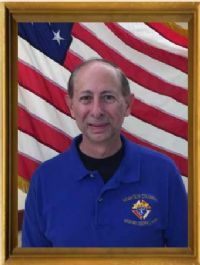 Chuck Wencl has been a member of the Knights of Columbus since 1974, when he returned from serving in the U.S. Marine Corps. Most of those years, Chuck has served in a leadership role - the last 10 as his Council's Financial Secretary. “As a kid, I'd watch the Knights come up on special occasions, and I always thought, 'what a great organization.' They've always put so much importance on families, members’ wives, and the parish's altar boys.” That impression stuck with him, and he eagerly joined once he was asked. He maintains his loves for the Knights of Columbus, calling it one of the greatest organizations. “I love to help out, and I love to meet people,” he said. “When I see other people so passionate about the Knights, how can you doubt an organization with so many passionate members?” he said, adding that it's been a great experience, and that it doesn't feel like work. That's a good thing, considering the amount of time Chuck gives back. He's a member of the First Degree team, and has served as his Council's recorder for 21 years. Chuck and his wife Jerrie are members at Christ the King Catholic Church in Medford. He says he's served on the parish council there, and will help with landscaping and decorating projects at his church. “Any time there's a need,” he said, “I'm ready to volunteer, because it makes me feel a part of the church.” Among Chuck's pastimes, tinkering, and fixing things, sight-seeing on his Harley Davidson motorcycle, and dancing to 50's and 60's rock and roll music. In fact, you might have seen Jerrie and him perform at this past year's “Dancing with the Steele County Stars” in the Senior Spotlight. Chuck has been working at Viracon for 41 years, and says he has no plans to retire any time soon. “Work is entertaining,” he said. “I get to teach optics in the glass industry. I just hope the next 41 years are as great as the last 41 years.” Chuck does have a bit of sage advice for everyone. It is, “Learn to laugh at yourself, and you'll be entertained for a lifetime.” And the Knights of Columbus is fortunate to have had Chuck's membership and fellowship for most his lifetime. Congratulations to Chuck Wencl, May's Knight of the Month! Note: Chuck is a member of the Medford Council. He has served many years as the Warden on our first and second degree ceremonial staffs. The April Knight of the Month is someone with a lot of history behind him – and he's a big part of Council 945's history, too. Dan Pirkl joined the Knights of Columbus more than 50 years ago when he was just 18 years old. He says he joined because his father and older brother were both Knights. He went on to help make the hall into how it looks today. Dan helped conceptualize the handicap accessible features in the building, and he also helped design the buzz-in lock system utilized in the bar area still today. Dan also says he helped with some of the design features (and some of the heavy lifting associated with it) to put the bar in its current place. Many of the younger members, Dan points out, may not know that the bar used to be much smaller and placed further to the west where the current card room is located. He enjoyed the friendships he gained with the Knights, and enjoyed helping out. “It's just part of my makeup, I guess,” Dan said. He continued, “There was a job to do, so we just did it.” Dan Pirkl is a native of the area. He was born and raised in the area. He graduated from what was then known as St. Augustine's Catholic High School in Austin. He was baptized, confirmed, and married at Holy Trinity in Litomysl, where he and his wife Karen remain members to this day. Together, they have five children, 11 grandchildren, and one great-grandchild. Dan was an electrician for 40 years before retiring in 2001. He said that some of his hobbies are fishing, hunting, and Nascar. In the past, Dan was chair of the Building Committee, and was even named Knight of the Year back in 1989. To this day, he's still called upon to help, and will do what he is able to do. And that's why Council 945 is once again honoring him. Congratulations to Dan Pirkl, Council 945's Knight of the Month for April! 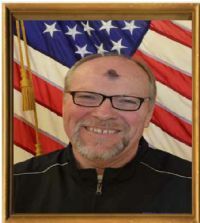 The March Knight of the Month is a relative newcomer to Owatonna, but not to the Knights of Columbus. Many of us may already know Luke Rennie through his work with the Knights of Columbus insurance program. Although he's been with Council 945 since last November, he's been a Knight since 1994. “It seemed to be the right thing to do,” he said of joining back then. Luke was a college student at Franciscan University in Steubenville, Ohio, when he joined. “I was asked. A lot of guys don't join unless they're asked. My friends and I were asked, and we all joined,” he said. Luke is a native of Bloomington, Minnesota. He got a degree in theology at Franciscan University. Along the way, Luke owned his own construction and remodeling business – but all along he wanted to work for a good business that held his same Catholic values. Then, about eight years ago, he was contacted because the Knights of Columbus were looking for a field agent. He answered the call, and has been working for - and with - the Knights of Columbus ever since. He says he got what he wanted. Luke has been married to his wife Amanda for 15 years. Together, they have five children that range in age from 13 to 1. In his spare time, Luke enjoys activities such as camping, hunting, fishing, and hiking. They attend Holy Trinity at Litomysl. Luke says he enjoys the brotherhood because of all the opportunities the Knights offer. He says, “There's something for everyone. You make new friends, develop a lot of good friendships, you have the chance to volunteer, to network with other businessmen, and there's a chance to get my kids involved in the community, too. There's just so many opportunities.” And his involvement has given Council 945 the opportunity to recognize his contributions. Those contributions include being a field agent for the insurance program, council meeting participation, and he's also helped out at the fish fries. Congratulations to Luke Rennie, Council 945's Knight of the Month for March! The February Knight of the Month enjoys helping out the causes of Council 945 – so much so that he was volunteering even before he was a member. Ben Trom was helping with setup at last year’s Smokin’ in Steele, and at the urging of LaVerne Klecker and Lee Jardine, joined the Knights of Columbus in the fall of 2014. He’s enjoyed giving his time ever since then. “I wanted to become more active in the church,” Ben said, adding that “this is a good place to volunteer and become more active in the church.” In addition to Smokin’ in Steele, Ben has volunteered his time at the benefit breakfasts and fish fries. He was happy to accept the honor of Knight of the Month, saying, “I’m glad I could contribute and help out whenever I can. I like the comradarie, being around like-minded people, and it’s always nice to volunteer for a worthy cause.” Ben grew up in Blooming Prairie and is currently employed at Cybex in Owatonna. He’s been married for about a year and a half to his wife Libby. They have an 11-month-old son and are members of St. Joseph’s Church. Ben is continuing his education by studying business at Riverland, and enjoys hunting, fishing, four-wheeling, and being out in nature in his free time. Congratulations to Ben Trom, Council 945’s Knight of the Month! The January Knight of the Month has been around for the better part of a decade, and is often seen helping out around the KC Hall. 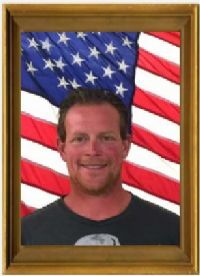 Chris Prohaski joined at the urging of his father, the late Ben Prohaski. “My Dad said it was what I had to do, so I did it,” Chris said. It became a good bonding experience with his father before his passing. Chris hasn't looked back since, helping out with various projects around the hall, whether it's plowing snow, repair jobs, the fish fries, burger baskets, or even Smokin' in Steele. “I have a gas,” he said. “I love it.” To hear him talk about his time spent with the Knights would remind you of a class reunion. He said, “I graduated from Marian High School, and everybody I knew from back then is down at the hall.” Chris has been married to his wife Jill for over 23 years. Together, they have two daughters, and are members at St. Joseph's Catholic Church. Chris is a member of the Fourth Degree. Chris was self-employed for a number of years in the development and construction industries, but is now semi-retired. He says in his spare time, he still works, but enjoys fishing, spending time with his family, and watching sports. Congratulations to Chris Prohaski, Council 945's Knight of the Month! The December Knight of the Month is a relative newcomer to the membership, but he’s someone who has been around the hall and his Brother Knights for many years. Tim Blum joined Council 945 in 2013, but his passion for giving back and helping others has helped him gain recognition. Upon receiving the award, Tim said, “I’ve been helping people all my life. It’s an honor for me to receive this.” It’s well-earned, too. This Owatonna native has helped at the Hall for various steak or shrimp fries, landscaping the grounds, ringing the bells for the Salvation Army, helping in the Tootsie Roll campaign, or Smokin’ in Steele. Why? “I like to help” is the simple answer. Tim enjoys meeting new people as well as knowing that he’s helping others and giving back. It’s why he joined the Knights, and what keeps him energized as a member. “I just wanted to be involved,” he said. “All my life, I’ve felt that if you give, it will come back to you two-fold. And great organizations like this are here to help.” Tim and his wife Kelly have two children. They’re members at St. Joseph’s Church. 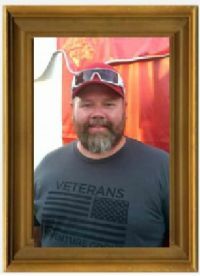 Tim is a self-employed contractor, and also served Owatonna as a firefighter for 19 years. In his spare time, he enjoys helping at charity events, waterskiing, fishing, and spending time with family. Congratulations to Tim Blum, Council 945’s December Knight of the Month! 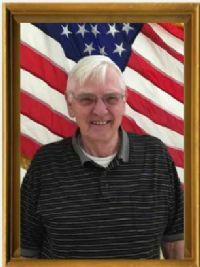 The November Knight of the Month is a lifelong Owatonna resident who's been active in a cause very dear to the men of Council 945: The Special Olympics. Tom Jirele says he's coached for Special Olympians for a number of years. He uses words like “fun” and “rewarding” to describe working with the athletes, adding, “I learn more from them than they do from me.” Tom says he joined four years ago, with Laverne Klecker as his sponsor. He found the Knights of Columbus appealing because “They do a lot of great things. It's a good Catholic organization.” He says he knows quite a few people who are active in the organization, and he's impressed with the volunteers who make the various events run smoothly. Speaking of those events, Tom's been involved with Smokin' in Steele, the Steele County Free Fair, pancake breakfasts, and Salvation Army bell ringing. Tom has three adult sons, and is a member of Sacred Heart. In his spare time, he enjoys helping people, and watching sports, including baseball, football, basketball, and wrestling. He's played softball for more than 20 years, and even was a part of a state championship with a Special Olympics team. Tom also enjoys traveling and family time. Congratulations to Tom Jirele, Council 945's Knight of the Month! The October Knight of the Month is a Steele County native and a local businessman. 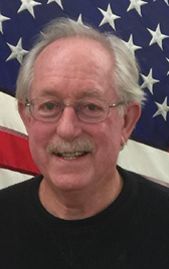 Ron Kubicek has enjoyed being a member of Council 945 for the past eight years. Sponsored by his father, Bruce Kubicek, Ron saw the Knights of Columbus as a good organization with a reputation of helping others. Since joining, he's been a part of the Tootsie Roll drives, the Salvation Army bell-ringing, the Andrew Lawrence Chili Cook-off, and helped out with ticket sales for the KC's Benefit Breakfasts. 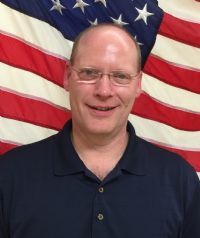 Ron grew up in Steele County and graduated from High School at Faribault Bethlehem Academy. From there, he graduated from St. Thomas University with a degree in Business Finance. For the past 9½ years, he's worked with his brother at Advanatage Cabinets, where Ron is the Production Manager. Ron and his wife Kim have seven children. They are members at Sacred Heart in Owatonna. In his spare time, Ron says he spends it “chasing kids,” however he also is an avid Vikings fan and enjoys anything sports-related. Ron said he's proud to be a part of the organization, because he's “working with good people doing good things.” And it's a good thing Council 945 has Ron as a member. Congratulations to Ron Kubicek, Council 945's Knight of the Month! Jim Wencl joined Council 945 more than 40 years ago. In his time, he's served in leadership roles with the KC's as Inside Guard, Outside Guard, and Chancellor. He even says he helped with the remodel of the KC Hall's downstairs back in the 1970's. He's also dedicated his time to pancake breakfasts, Tootsie Roll drives, the Richard Roher Christmas parties, the Free Fair brat stand, and even the bingo crew from many years ago. It's this history of helping that makes him the September Knight of the Month. Jim joined in the early 70's because he and a friend worked together as plumbers, and he'd been doing a lot for the church at the time. He says that he enjoys being with the guys. “There are a lot of my friends there,” he said. “I really enjoy the social events.” Jim and his wife Barbara recently celebrated their 50th wedding anniversary. They are members at Sacred Heart, and they have two children. Jim is now retired after working at his own company for many years, Wencl Plumbing. In his spare time, he enjoys spending time at the lake, fishing, hunting, and enjoying his vintage cars that he's had restored. Congratulations to Jim Wencl, Council 945's Knight of the Month! The August Knight of the Month is certainly no stranger to the Knights of Columbus. George Lambaere first joined the Knights when he was a freshman in college back in 1965. He did it because of the strong example his father set for him. George grew up in St. Ansgar, Iowa, and saw how active his father was with his local Council – so he thought it was something he should do, too. After graduating from St. Mary's University in Winona, George moved to Owatonna to teach at Marian High School. 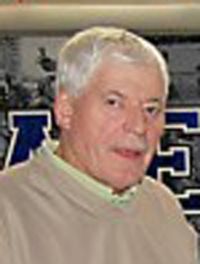 After Marian closed, George worked at a hospital for adolescents in Faribault before coming back to work for the Owatonna Public School District in 1995, where he eventually settled in as a counselor for the district. He retired last year. Somewhere in that time line he partnered up with Council 945, and has been involved ever since, whether it's Adopt-a-Highway program, the spaghetti dinners, the KC food stand at the Steele County Free Fair, Smokin' in Steele, the benefit breakfasts, the Tootsie Roll drives, Salvation Army bell-ringing campaigns, or even the Halloween parties. George has experienced all of that – simply by saying, 'yes' when he's asked to help. For him, it's something he enjoys. “It's fun,” he said. “I like hanging out with the guys and doing the projects we do. I like seeing the guys at the club. They do a nice job, and our Council has always had good leadership.” George and his wife Terri are members at St. Joseph's in Owatonna. They have three grown children and a total of five grandchildren who keep them busy. It's those grandkids who keep him busy... and happy. “I really enjoy spending time with them,” he said. In addition to those grandkids, George enjoys fishing, including a yearly trip to Canada. He also likes to golf and has traveled extensively. He's also run the Twin Cities Marathon six times. And Council 945 is happy he's been in it for the long-haul. Congratulations to George Lambaere, our August Knight of the Month! 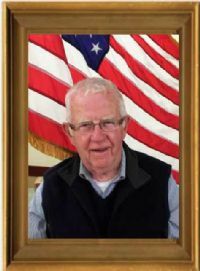 Our July Knight of the Month says, “it's hard to believe it's been 40 years already.” That's how long Jim Joachim has been a member of Council 945. Yet, he's been an effective member all these years, and he's now getting the recognition he deserves. Jim is a lifelong resident of Owatonna. He was recruited by LaVerne Klecker back in 1974. Since then, Jim's made it to a number of benefit breakfasts; brat stands at the fair, and Tootsie Roll drives. Jim also says he likes to participate in the monthly meetings, and he also sings in the KC Choir. He's been a member all these years because, he says, “I enjoy the fellowship and my fellow members.” Jim currently works for the Steele County SMART Bus system as a driver. In his spare time, he enjoys gardening and woodworking. He's a member of Sacred Heart, and has three children. Jim has two grandsons, and has two more grandchildren on the way. Congratulations to Jim Joachim, Council 945's Knight of the Month! The June Knight of the Month has worked more than a quarter-century for the good of his community. Bruce Born has logged a lot of service hours over those years as a member of Council 945. Those service hours have included handing out Tootsie Rolls, benefit breakfasts, Smokin' in Steele, and in the past, he would even take a week's vacation just so he could work the food stand at the Steele County Free Fair. Bruce also is one of the original members of the Fourth Degree in Owatonna. Bruce is a native of Ellendale, but has lived in Owatonna since 1979. He and his wife Denise are members of Sacred Heart Church. The couple has three grown children and three grandchildren. He is approaching retirement, and says he is happy to help when he can. “There's really no best part about being a Knight,” Bruce said. “I enjoy being around the people. They're all very friendly, whether we're working hard or just having a good time.” In his spare time, Bruce enjoys boating and spending time with his grandchildren. Of the Knight of the Month award, Bruce said, “I'm grateful, but I'm not sure I'm deserving.” However, Council 945 is grateful for the many years of fellowship and service from Bruce. Congratulations to the June Knight of the Month, Bruce Born! The May Knight of the Month is a young man with plenty of energy – and he’s sharing it with Council 945. Ryan Sanford joined the Knights back in 2012. Sponsored by his father, Gary Sanford, Ryan saw how he gave back to the community, and wanted to be a part of it. He said, “I saw how much fun he was having while giving back to the community, and I thought it was something I’d like to do.” Ryan’s been involved with the Friday night dinners, Smokin’ in Steele, the Tootsie Roll drive, and he’s helped solve computer issues at the KC Hall’s business office. It’s all something he’s more than happy to do, saying that simply “giving back to the community is the best part about being a Knight.” Ryan’s spent most of his life living in Owatonna, and after high school, graduated from ITT Tech in Eden Prairie. He’s been working in the computer IT field in Edina for Dell Compellent for the past two and a half years. 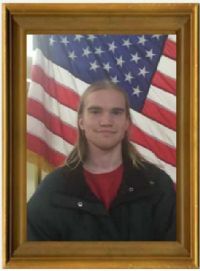 A member of Sacred Heart, he likes to work on computers in his spare time, in addition to hunting, fishing, and playing disc golf. Congratulations to Ryan Sanford, Council 945’s May Knight of the Month! Bill Bunkers is a lover of antiques, sports, and public service – and for that last item, Council 945 is loving him back and recognizing him as the April Knight of the Month. 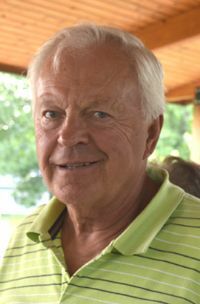 A native of Fulda, (in southwest Minnesota), Bill graduated from college at South Dakota State University, eventually earning his Master’s Degree from Mankato State University and the University of Minnesota. 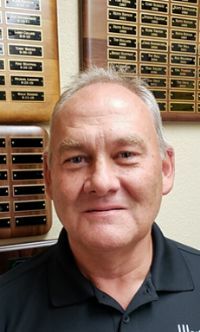 He worked in public education for 32 years, and eventually settled in as Junior High Principal in the Waseca School District, serving there the last 12 years of his career before retiring in December of 2012. However, he was coaxed out of retirement and now serves as administrator (part-time) at St. Isidore’s in Litomysl. Bunkers first joined the Knights of Columbus when he was living in Blooming Prairie back in 1979. Giving back was the draw. He said, “I wanted to be more active in the church and the community, and that was one way to do it.” However, he’s gotten much more out of it after helping out at the fair, the Tootsie Roll drive, the many benefit breakfasts, the Fish Fries, or Smokin’ in Steele. He said the best part is the comradarie and fellowship with his Brother Knights, adding, “I like doing public service, but I really like the guys I meet, regardless of the project we’re helping out on. It’s nice to get to know guys you wouldn’t otherwise meet.” Bill is a member of the Fourth Degree. He and his wife Alana are members at St. Joseph’s parish, and have three grown children. He is proud of the fact that all three have college degrees. In his spare time, he enjoys collecting antiques, including this three classic cars – one of which was his great grandfather’s car. He and Alana also enjoy traveling. Bill is proud to be a member of Council 945. He says it’s because the organization has “a lot of good people who do a lot of good things that are behind the scenes. It’s a great organization.” And Council 945 is proud to have Bill Bunkers as a member. Congratulations to Bill Bunkers, our April Knight of the Month!